A daycare worker employed by Northeast Health in Albany New York was shocked to be told by her boss that she would be fired if she refused to take a seasonal swine flu shot on the spot. Similar stories have been pouring in to us from all over the country as fears that the upcoming H1N1 shot will also be mandatory continue to grow. The case emphasizes why President Obama’s claim that the swine flu shot will be voluntary is completely deceptive and misleading. Americans across the country, even those not directly connected with health care work, are being ordered to take the mandated seasonal and swine flu shots or lose their jobs. The story of what happened to the daycare worker, who would like to go by the pseudonym “Clare,” was sent to us by her sister who also provided Clare’s real name and the full name of the facility she is employed with. Clare works in a daycare center which is affiliated with the local hospital but in a completely separate building. It was reported earlier this month that all hospital workers in the entire region would be forced to take the seasonal flu shot or lose their jobs and that the vaccine would become a condition of employment. “On the Tuesday morning following the Labor Day weekend (Sept 8th), the director of the daycare of Northeast Health announced to employees on the spot (without a meeting, memo or discussion) that everyone had to go get a flu shot immediately and staff would be rotated so that everyone would be inoculated by the end of the day,” writes Clare’s sister. The director told Clare that the H1N1 shot would also be mandated in the same way when it becomes available. When Clare warned the director that the swine flu shot contained mercury, squalene and other dangerous additives, the director told her that regardless of her objections, if she refused to be vaccinated she would be suspended from November 13th and then formally fired on November 30th. “Clare asked how she can be fired for something that was not a condition of her employment when she was hired? She was told it was not Northeast Health’s policy, it was the director of the New York State Department of Health who made the shot mandatory,” writes her sister. However, according to the NYSDOH decree for mandatory vaccinations, exemptions exist for “personnel who have a medical contraindication and for workers, such as those offsite, who would have no contact with patients and only incidental contact with direct-care staff.” Clare clearly falls into this category as she works in a separate building from the hospital and has no direct regular contact with hospital workers. Clare demanded answers to the following questions, none of which have been addressed by the daycare director. 1. The regular seasonal flu hasn’t even hit so how will this first mandated shot provide any immunity when it is clearly the vaccine from last year? 3. Should I refuse the shot will I be eligible for Unemployment Compensation since I did nothing to warrant being terminated? 4. Malpractice insurance providers in Australia are refusing to extend coverage to their clients who give the shot; will this be the case in New York? 5. Are insurance companies going to cover subscribers who fall ill as a result of the H1N1 inoculations that were mandated by the NYS Department of Health? After concerned parents started to ask Clare why she was leaving, it some became apparent that the director had immediately produced a letter and circulated it around the daycare, claiming that Clare was leaving for “personal reasons,” without mentioning the real reason, that she refused to take the vaccine. “Not only have my sister’s rights as an employee been violated but her employer’s justification for terminating her is based on a falsehood on top of which she may be prevented from receiving Unemployment Insurance for this wrongful termination,” writes Clare’s sister. 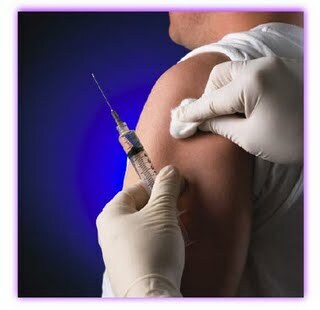 Clare is now facing unemployment as a result of refusing to take the seasonal flu vaccine, not to mention the H1N1 shot. Thousands of other health workers are now in a similar position whereby they will be forced to take the dangerous swine flu shot or be fired over the course of the next few weeks. Polls indicate that at least a third of nurses and health workers will refuse to take the vaccine and another third are still unsure. If even as little as a quarter of health care professionals stand up in unison and refuse to be intimidated into taking the shot, authorities will probably have to back off and make the shot voluntary. However, Clare’s deeper concern is that another primary target of the first round of swine flu vaccinations, young children, will be even more vulnerable to having the shot forced upon them with no warning or notice whatsoever. “My sister has three children in public school and is extremely concerned that the head of the New York State Department of Health, Dr. Richard Daines, will next decree the shots are mandatory for all school children,” writes Clare’s sister.